Jeff Koons has had his share of ups and downs in the art world, and is certainly one of the most controversial artists working today. But for anyone living in or visiting New York City this summer, it’s clear that he has taken the international epicenter of the art world by storm. His giant retrospective at the Whitney Museum of Art—a long-awaited first for the artist and the final show at the museum’s Madison Avenue address before moving to a new Renzo Piano-designed space in the Meatpacking district next year—just opened amidst highly positive media reviews. The exhibition is the first comprehensive survey of the artist’s career, as well as the first to fill nearly the entirety of the Whitney’s Marcel Breuer building with a single artist’s work (might as well go out with a bang, right?). 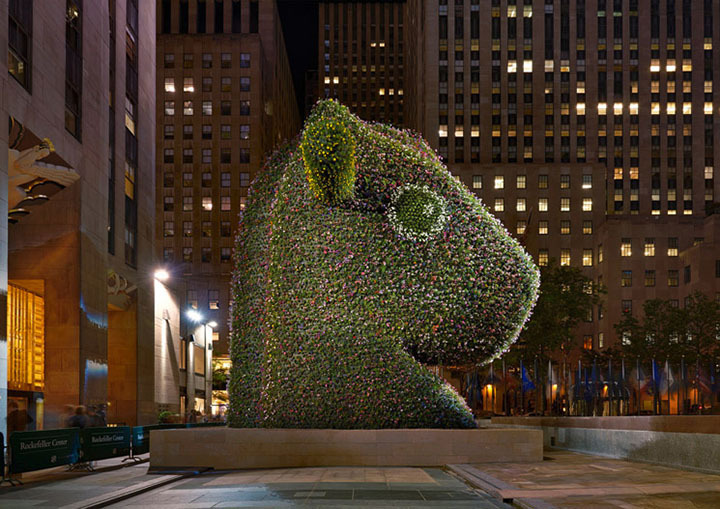 Couple the ambitious exhibition with the artist’s Split-Rocker in Rockefeller Center—a monumental public sculpture made with living flowers, and presented by Public Art Fund and Gagosian Gallery—and it’s obvious Koons is at the height of his career. No matter your opinion of the artist’s work, he has certainly made accessible art, making him a perfect partner for fast-fashion chain H&M’s first-ever artist collaboration. 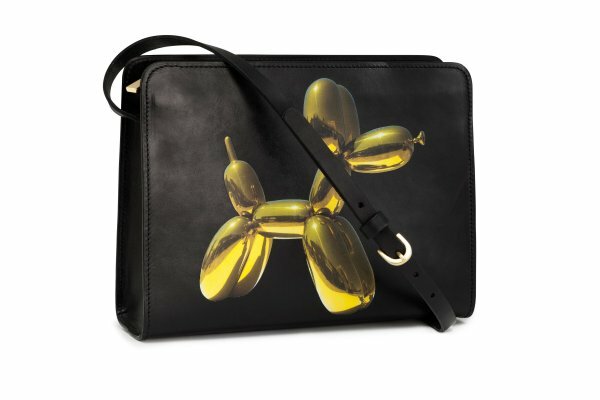 Starting July 17th, art and fashion enthusiasts can snag Koons’s $58 million balloon dog sculpture for just $49.50 in the form of a limited-edition leather handbag. Koons will also redecorate H&M’s Fifth Avenue flagship store, with images of the balloon dog glossing the six-story facade alongside the phrase, “Fashion Loves Art.” Talk about highbrow-lowbrow. 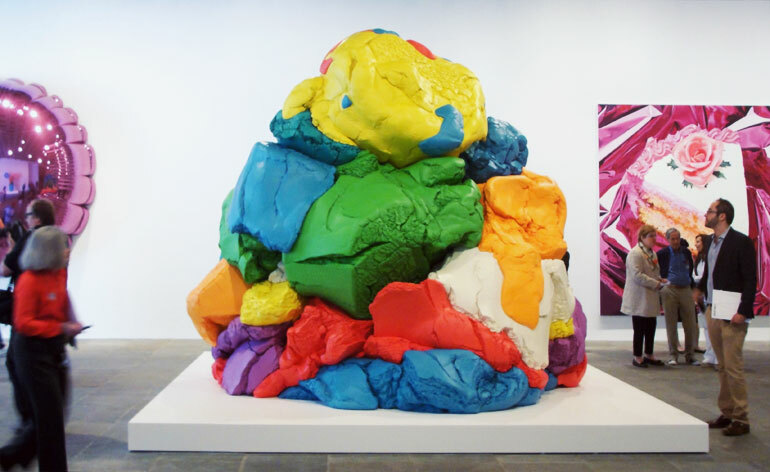 Koons’s Play-Doh, 1994-2014. This 10-foot-high multicolored aluminum sculpture took him 20 years to complete and makes it’s first-ever debut in the exhibition. Image via Wallpaper Mag. Koons’s Split-Rocker, 2002. On view at Rockefeller Center through September 12. Photo via Public Art Fund. 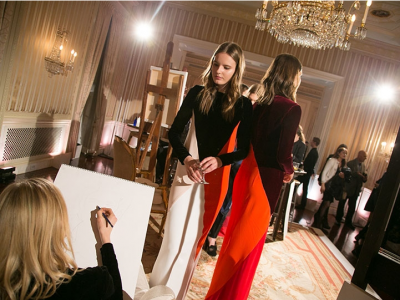 Very rarely does a fashion event attract so many art world notables, as did Stella McCartney’s Pre-Fall 2013 Presentation, held at an Upper East Side townhouse earlier this month. The designer had her models mingling with guests, with the goal of creating an theatrical, out-of-the-ordinary “happening” in which she could show her new collection. In one room, Grey Area (a company that I often write about as a result of their goal to promote works that intersect the worlds of art, fashion and design) created a studio-like setting in which models served as muses to artists John Gordon Gauld, Miky Fábrega, and Catherine Delphia, who painted the models on easels during the presentation. Whereas the typical fashion presentation involves models standing still in an organized lineup as viewers walk by examining the clothing, McCartney’s interactive affair was rather unique. 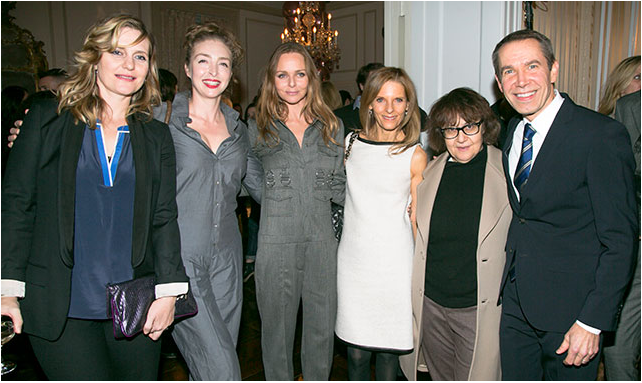 Hence the attendance of said art world notables, including Jeff Koons, Rachel Feinstein, Rob Pruitt, Ingrid Sischy, and Gavin Brown. As if I needed more evidence I need to start an art and fashion event company…! Lisa Perry is most known for her 1960s-inspired clothing and accessories. Her minimalistic designs, composed of bright colors, clean lines and classic silhouettes, have gained quite a following since she launched in 2006 (Ann Curry is a huge fan – she even wore a custom Lisa Perry dress for the Today Show’s 60th Anniversary). Perry seeks inspiration not only from her vintage clothing collection from the late 60s, but also from art of the same period, and Pop Art in particular. Her love of art has led to multiple collaborations with artists or their estates on capsule collections (including Nat Finkelstein and Roy Litchenstein), and her most recent is the much buzzed-about Jeff Koons Collection. 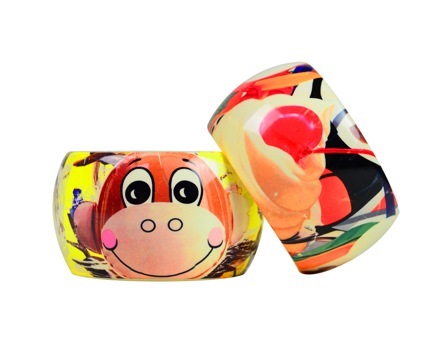 The limited edition clothing and accessories feature some of Koons’ most iconic images, including Loopy, Rabbit, Monkey Train and Pink Panther. You can find the collection exclusively at Lisa Perry’s store on Madison Avenue (a visit to which will immediately brighten your mood – as will serving dinner atop her hot pink placemats!) or on LisaPerryStyle.com. I have my eye on pink panther and monkey train….! The merchandise at the Lisa Perry Boutique – I told you it was a happy place!